What does a Maker Corps Member do? Maker Corps Members are maker-in-residences at participating organizations. Our Maker Corps 2016 partner sites represent an inclusive spectrum of youth-serving organizations and programs with many museums, libraries, schools and school districts, science centers, after-school and community-based programs– and because Maker Ed recognizes and encourages a wide variety of making– every partner site is unique in their program offerings and audience. Read about our past Maker Corps partners here. Interest in creativity, DIY art and science projects, and making things. Ability to engage effectively with children, adults, and organization staff. Excellent leadership, communication, and presentation skills. Awareness and sensitivity in interacting with diverse populations. Curious about past Maker Corps Members? We have a profile series featuring past Maker Corps Members: Meet a Maker. 50% of a Maker Corps Member’s time must be dedicated to direct service– engaging children and families in creative making opportunities, while gaining experience serving as a community leader. Maker Corps Members will also spend a portion of their time as makers-in-residence, focused on developing ideas and programs for their partner site. Maker Corps Members are required to participate in the Maker Corps online community by contributing stories, photos, reflections, etc. Applicants must live, or be willing to relocate to, a community hosting a Maker Corps program. Note that the Maker Ed will not cover any additional moving and/or housing expenses. However, some partner sites may provide assistance. Please inquire specifically about these needs in your application. In the tradition of our community’s namesake the Edison Public Library is proud to announce that it will be incorporating a Makerspace as part of its collection of services to the community. Some of you maybe wondering just what a Makerspace is. Makerspaces as a concept are a little hard to define but generally they can be thought of as creative workshops designed for the community to explore and invent. They align nicely with the current STEM (Science, Technology, Engineering and Math) movement in education but can include creative crafts and is available to all ages. In the beginning the Edison Makerspace will be outfitted with an iMac and Makerbot 3D printer and a workbench stocked with hand tools. We will also be including a quilting sewing machine that sews programmed patterns from a template. Furthermore, we also have plans of including video recording capabilities and a keyboard for music composition. Arduino kits and Raspberry Pi kits have also been provided to allow you to explore and design anything from flashing display signs to robots and wearable technology. J. Lexi, LLC started as a path to financial freedom; hey that’s the biggest reason people become entrepreneurs! I wanted to create something for myself + family that was natural + represented quality + love. However, J. Lexi is not just about my financial independence + offering you great products to create uncommonly beautiful healthy skin, it is also about giving back, investing in community + finding something bigger than myself that I can contribute to + make a difference in! Using the bounty of nature we create skin-loving recipes to nourish your hair, face + body! At J. Lexi, LLC we believe ingredients are best as nature created them. Our holistic natural products are handmade in small batches + contain a combination of fresh, raw fruits, vegetables, , probiotics, fermentation, herbs, botanicals, vitamins, proteins, superfoods, amino acids, milks, creams + more. Marshall Sealy – Hornsinger from Jeff Zelevansky on Vimeo. At Maker Faire Newark Marshall will be making and repairing brass instruments, making new instruments out of old brass parts from instruments, and repaing several dented and bent brass instruments. Marshall will also give a performance on newly-made brass wind instruments! Greater Newark Conservancy invites makers to join us in growing a greener Newark. From community gardens to greenhouse hydroponics, community members are taking part in learning about, growing, and making healthy food. At our urban environmental education center green makers of all ages participate in hands-on, inquiry based environmentally themed programs. Two urban farms produce abundant harvests in the heart of the city that Newark Youth Leadership Project (NYLP) teens market through our Youth Farm Stand and Membership. Learn more about Hydroponic Gardening at the Faire! Cyprus Maker Community is a Livingston based maker community dedicated to extending the maker movement outside STEM. We are geared towards both children and adults, with a large following in both high schools as well as from professionals in the field. We believe one of our greatest accomplishments has been extending ourselves to athletes and those not involved in the STEM community. We pride ourselves in our award winning Robotics team, which participates in worldwide competitions such as FIRST; we’ll be exhibiting one of our designs here as well! Learn to control and drive their robots at Maker Faire Newark! Merging our love of new technology and old-fashioned fun, we develop hi-tech, hi-touch toys and environments to engage children and adults in the workings of the world. With several new lines of eco-friendly electronic and non-electronic products, we continue to provide thoughtful, interactive experiences to a market of curious consumers. Sparkle Labs’ concepts have been recognized by media outlets I.D. Magazine and AIGA and at international exhibitions such as Ubicomp, the Gwang-ju Design Biennale (Korea) and the International Art and Science Exhibition (China). 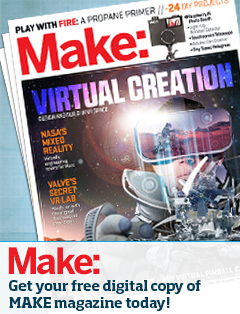 Sparkle Labs is a frequent Make Magazine contributor whose work is featured in the recent book The Best of Make.